Nine of us went to The Kelling Heath Spring Star Party which was a very well planned event organised by the Norwich Astronomical Society. It is a very dark site and they went to great lengths to reduce light pollution. One of the first things we noticed was the information tent where you could find weather forecasts, a people finder map, moon rise and set times, ISS flybys, Iridium flare co-ordinates, lecture ticket sales, and information on traders. There was also the opportunity to buy and sell kit if you so desired. Everyone was very friendly and helpful and we had the opportunity to talk to other imagers and observers. Sue and I recognised Ken from the Loughton Astronomical Society who had joined us on the Paris trip. There were two lectures on Saturday afternoon. One was entitled Fun with CCDs by Steve Chambers and the other Galaxy Clusters for Every Man by Owen Brazell. The camp site itself is very easy to find and the facilities are positively luxurious with electrical hook-ups and a shower block with plenty of hot water. It even has under floor heating which is brilliant for warming cold feet if you take your shoes off first. There is a large shop, a restaurant, and a well stocked pub with free half hour internet if you buy a drink. For the energetic there is a fitness centre, swimming pool, a bike hire place and a fishing lake. 90% of the pitches had very very good visibility, with low trees and were a good size with electrical hook-ups for laptops etc.. 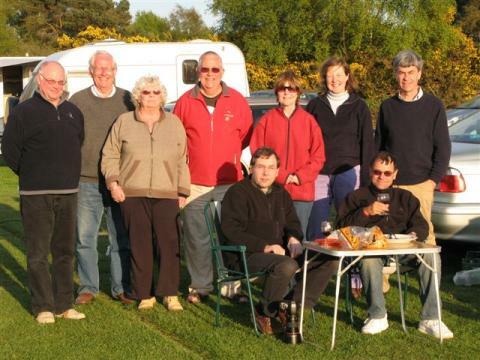 The weather was sunny but windy when Rose, Doug & Sid, Sue & Roy, Ian & Delphine arrived during Thursday. In the evening the conditions were hazy but good enough for observing, though not perfect for imaging. It was bitterly cold but Sid came to our rescue by lending us an electrical lead with the correct socket so that we could use our electric kettle and toaster – bliss! Rose also supplied endless warming cups of tea. By the time Mark and Robert arrived on Friday afternoon the wind had dropped and the conditions had improved with an excellent sky. Just after sunset we could see Mercury with the naked eye at its maximum elongation. Easily seen in my 4” refractor. Robert and Mark stayed up all Friday night until about 4.30 a.m. Mark to image M101. On Saturday night the conditions were even better so he imaged M51 whirlpool. Robert imaged Markarian’s Chain, Gamma Cygni nebulosity, Gulf of Mexico, M81, M82 and 5 globular clusters. The camping field was littered with some very large telescopes. The Norwich AS has several members who have built their own massive 16 to 20” dobsonians. Much to our delight on the Saturday night they invited us to come and have a look at M51 and the Leo triplet – very impressive. If you can tear yourself away from astronomical discussions there is plenty to do during the day as well. At nearby Weybourne there is a working military museum, the Muckleburgh Collection, where you can have an exciting coastal ride in a Gamma Goat for £2.50 or even a tank drive if you have £100 to spare. The campsite itself is very attractive and a very short walk through the gorse took us to a steam and diesel railway with lovely views towards the sea. Sue, Roy, Ian and I watched the steam train passing through while Rose, Doug and & Sid went to investigate the bird sanctuary and Sheringham market. The Autumn Equinox Star Party is from 14th to 25th September 2009 with the main day being Saturday 19th and will be run by the Loughton Astronomical Society. At the time of writing this one is fully booked but there is always the possibility of cancellations. 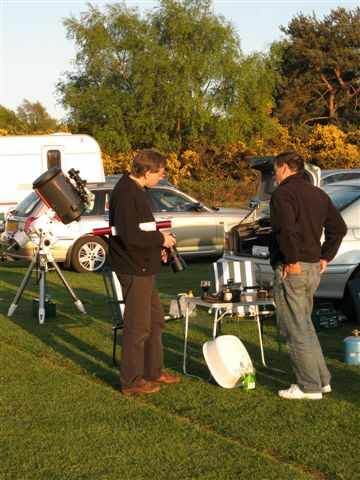 The next Spring Star Party is from Thursday 15th to Monday 19th April 2010. A big thank you from us all to Carole who organised the trip but unfortunately couldn’t join us due to an injury to her shoulder.